Structure, Surface, Sensation - an imaginary holistic approach. In setting up the first part of the project I’ve been looking into git, and how it can help me document the making, and think about structure. I had a very limited understanding of git (and still do) - but I think I basically understand how it can benefit the project, and have had some useful ideas as to how to use git from an artistic perspective. When I first saw the structure of git (an instance of which can be read about here), I immediately was drawn to the tree-ness of the structure, and it reminded me of adventure games. My initial general idea is to be able to navigate the software from it’s inception point - and have complete freedom of perspective, and be able to move through builds/scenes/development as if it was being developed right in front of you. In any particular scene, it would initially appear undeveloped, and as it you move through it unfolded - the player would be following the ‘life’ of the thing. Git branches that developed into ‘dead ends’ - or incomplete features would be as important as finding the main trunk. Perhaps the decision to move through builds has to appear as choice to the player, but I still haven’t conceived of what that choice would look like. It would look like life, whatever it is. After talking about this idea with Hamish and Edison there were several other ideas that sparked off that one. Edison suggested tagging the git commits so an outside wrapper could access them - the player would frequently return to the wrapper as one way of engaging with the work, similar to the pseudo-dos-prompt-world of ‘Memories from a Broken Dimension’. Talking with Hamish about assets that I make, that are put within the work evolved the idea where general structures would be suggested for development - perhaps abstract concepts as well as concrete ones. Ideas like ‘Love’ or ‘Joy’ - would be separately formed into separate subdirectories - Love_v01, Love_v02, Love_v03, as well as the concrete - Crocodile_v01, Crocodile_v02. This would enable an outside play participant to engage - and allow combinations of previous assets - (i.e. Love could be formed from Crocodiles and Joy, for example). This idea was also directly inspired by the previous plastercine play, simplified aggregation of limited technologies suggesting more than the sum of their parts. 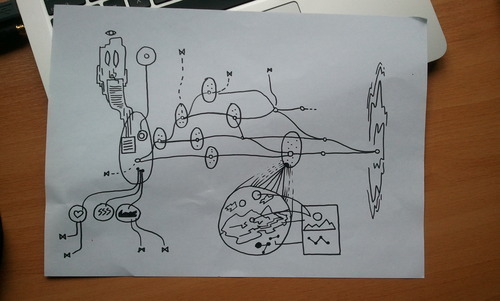 Here’s a drawing which sums up my ideas about the structure of the thing at the moment. Those ‘points’ are build stages in the software, being fed by multiple inputs, part of which are those ideas I just wrote about. I imagine this diagram is moving, and based on your understanding of it, things are spatially shifting too. Some further thoughts about structure. In considering the relation of my painting as a series of actions applied to a 2 dimensional surface, I also thought about Unity scenes. Any scenes generated in Unity are also kind of interlinked surfaces, and I’m wondering how these actions could relate to making within this space. There sometimes participants, sometimes wrapped in larger or smaller bodies, sometimes invisible as well as all of those previously mentioned. I lay down smaller, patches of colour that form into the ‘dumb drawing’ - a simplified sketch. In Photoshop I affect the whole thing at once, and create depth. In Unity inevitably I have to work on a single element at a time - it’s impossible for me to work on logic and models, lighting, geometry, and sound at the same time. Isn’t it? What if I could set up sensors in order to record a total expressive-ness that could translate into a complete Unity scene? Last Wednesday I was reminded again of the reality that our spectrum of sensation is constantly being filtered, and our mind is constantly working in order to simplify that chaotic stream into something. I want Technology (as mind) that enables the sensing of every expression in action and mindset, as well as the context to affect the entirety of any artifact created. Context is definitely important. At the moment making Unity works usually involves working on one specific aspect or item of the entirety at once, and it doesn’t usually pay attention to the when and where of the making - but equally that’s a conscious choice, of what to include, and what to not. Maybe if you don’t catch everything you aren’t really making a decision to leave anything out. The unknown/known matrix is the map for this area of catchment. Some of that context gets translated, and we get directors cuts, bonus additional features, subtitles, and documentaries, and public talks in linear media. Youtube is a narrow tunnel. I’m not concerned about the speed of intake - but in widening the possibility spectrum of the heard. So I can sing or hum with just facial movements, thanks to Osculator and Ableton Live. Maybe I could dance to suggest the tone of the environment, and the speed of the movement could make form, and even rig that geometry, at the same time producing animations for it. How should I think of making that logic happen? Dictation seems like an interesting idea, but song structure too. Perhaps I hum a tone, then hum another tone lower, and this could parent two objects in my vicinity. Last Wednesday I had a distinct felt sensation whilst considering relationships between several ideas. I know I felt their flow and ebb, and their own conflicts appeared almost solid, like boundaries. When I sensed these boundaries, my right hand, palm open to my left side, was raised to my bodies centre axis. In performing this action I acknowledge the conflict between ideas, and hold myself (as an idea) - still, awake in the wash.
Perhaps any recorded movements would have musical sections - in which separately limited ranges of things could be recorded. An instrument which transforms in your hands, or perhaps based on your orientation. Singing the scripting, grimacing the architecture, and dancing with and around the concepts and characters that emerge within. I want that!